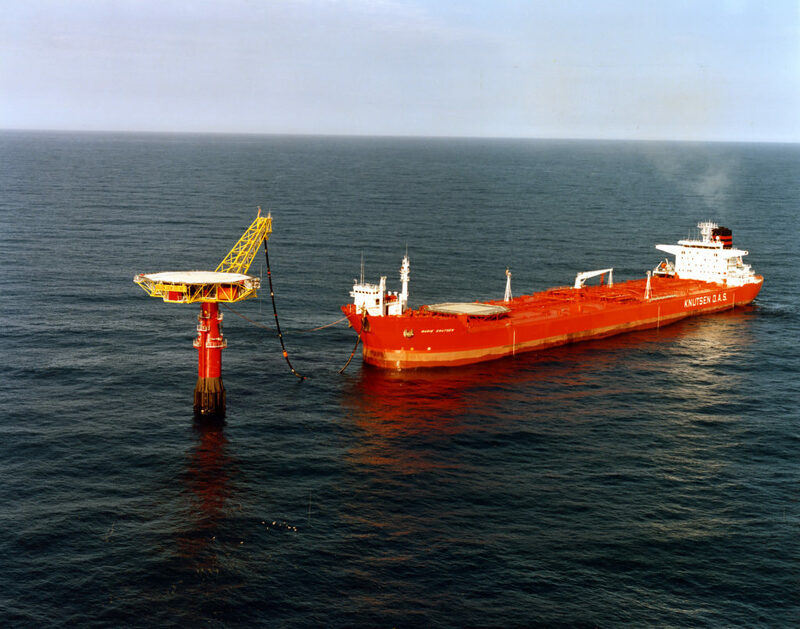 It became clear on 3 May 1991 that Aker Verdal was to build the first loading buoy which would ensure that oil from Draugen could be exported via shuttle tankers. 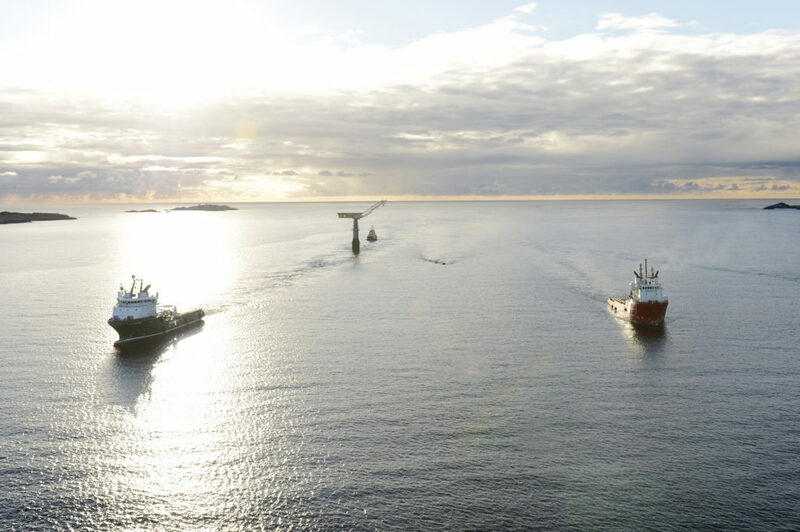 This NOK 345 million contract represented a collaboration between the yard, concrete platform builder Norwegian Contractors and Switzerland’s Single Buoy Moorings Inc (SBM). [REMOVE]Fotnote: Dagens Næringsliv, 4 May 1991, “Aker Verdal bygger lastebøye til Draugen”. The buoy comprised a 100-metre-high cylindrical column with a maximum diameter of 8.6 metres, to be moored in 250 metres of water with the aid of six anchors. Thirty metres of the column was visible above the sea and carried a rotatable topside containing a modest living quarters (for emergency overnight accommodation). In addition came a small instrument room, a generator room, a workshop container and so forth, plus a helideck and loading boom for connecting to the loading system in the shuttle tanker bows. This topside structure accounted for about 350 tonnes of the total weight of the floating loading platform (FLP), which came to 4 100 tonnes. It was installed about three kilometres from the production platform, and was connected to the latter by two 16-inch flow lines. As early as six years after oil production began, however, Shell began to seek a replacement for the FLP which guaranteed a longer working life. [REMOVE]Fotnote: Petro.no, 4 February 2000. “Draugen får ny lastebøye”. This was rendered necessary by the realisation that the field would remain on stream beyond the 20 years specified in the plan for development and operation (PDO). [REMOVE]Fotnote: A/S Norske Shell (September 1987), PDO, chapter 4.3.1. The weather in the Norwegian Sea was a challenge which restricted when loading could take place. Shell therefore wanted to improve accessibility for the shuttle tankers. In 1998, however, no technology was available which could provide the required loading window. More than a decade was to pass before an appropriate solution had been found. However, an accident occurred in January 2008 while loading oil on Draugen at the same time as a project to expand the capacity of the FLP system was under way. The Navion Skandia tanker was lifting a cargo destined for a refinery in the North Sea basin when a leak occurred which caused a crude oil spill directly to the sea. This had no major environmental consequences. [REMOVE]Fotnote: Petroleum Safety Authority Norway, Report “Draugen – brudd i lasteslange 10.01.2008. But a similar accident had occurred on the Statfjord field in the North Sea the year before, when the actual loading hose was damaged. In the Draugen case, the cause was not the hose itself but activation of a special release coupling which disconnected ship and buoy. Its design meant only a limited volume was discharged. 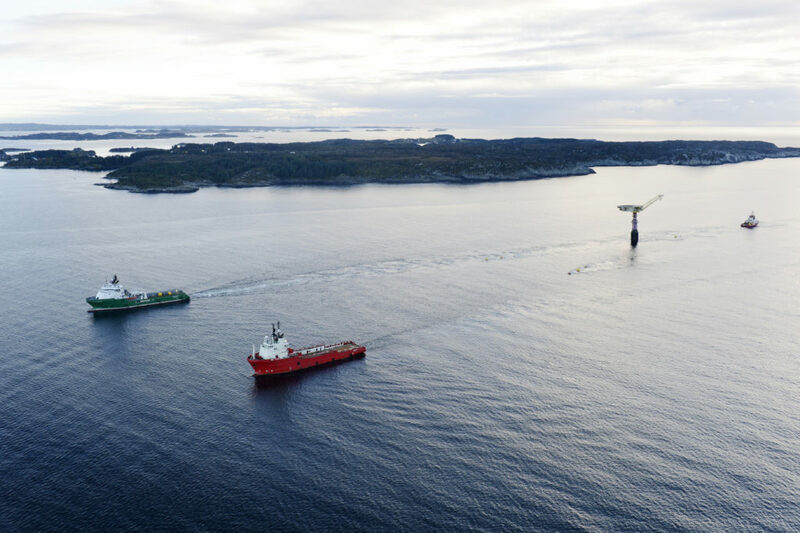 Shell subsequently intensified its search for an improved loading system, and opted for a solution developed by Norway’s Framo Engineering company. Despite being untried, this was chosen in preference to several similar designs which were outcompeting the buoy solution which had dominated offshore loading since the early 1980s. The contract to take away the old Draugen buoy and install the new system was awarded in 2008 to Subsea 7 together with Bukser & Berging. Removing a simple buoy from the field might seem a fairly straightforward business, but this job turned out to present a few challenges. Planning was well under way when preparations for installing the new system were halted – in part because of problems with the design requirements. That slowed progress and delayed start-up. Towing the former Draugen FLP began on 7 October 2012, using all three of the old towrope attachments to ensure a controlled move away from the safety zone around the platform. As soon as the buoy was outside this mandatory 500-metre area, one of the cables was cast off from its attachment in order to speed up the tow. When the voyage had got underway, however, a certain amount of swaying was experienced which threatened to put extra strain on the connection between column and topsides. Such motion was not unexpected once speed, waves and weather picked up, but it began almost immediately. But the tow went well because some compensatory measures had been taken. The actual topside was installed on a slewing crane bearing, precisely to offset the effect of sea forces even during normal operation. A brake disc has also been incorporated in the bearing with a governor system (brake callipers) intended to moderate and control such motion. Exactly a week later, on 14 October, the buoy moored at the town of Stord south of Bergen to be readied for disassembly and recycling. The Norwegian Coastal Administration had given Scanmet AS permission to moor in a position off Eldøyane for 180 days before the buoy was towed off for scraping. It became clear in the early spring of 2013 that this operation required more planning, and a temporary mooring permit was obtained up to 1 October. On 9 September that year, the coastal administration informed Stord local authority that this permit had been extended to 1 June 2014. This was because planning and preparing for the removal of the submerged part of the buoy proved far more complicated than first thought. The column stood vertically in the sea, but it needed to be turned on its side. That called in turn for a powerful lifting vessel. Long planning and finding spare lift capacity meant the job was not ready in September, and the operator could not guarantee that the column would be removed before the spring of 2014. However, the topside was disconnected from the column and taken ashore during October 2013. [REMOVE]Fotnote: Stord Nytt, 16 September 2013, ”Ny utsetting for hogging”. The following spring, the column was turned to a horizontal position, lifted and put on a barge. This could then be floated into the dry dock at the Kværner Stord Verft yard. After being cut into lengths of 10-15 metres, it was taken by a multiwheel transporter to the Scanmet scrapping site for cutting into smaller chunks, sorted and sent to various metal smelters. 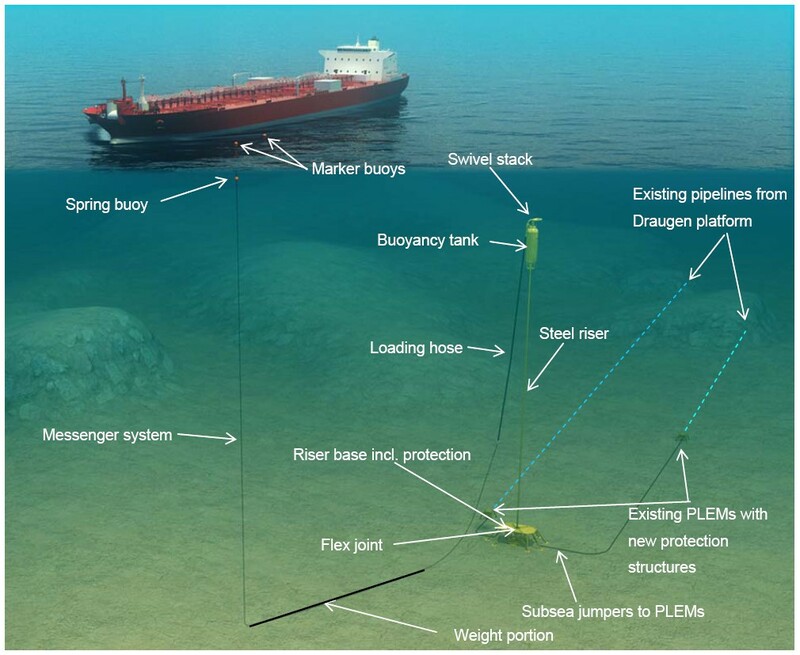 The replacement Framo submerged loading system (FSL) comprises a number of components with different functions, including a seabed base supporting a rigid riser. This base primarily provides a fixed point for two flowlines bringing oil from the platform. 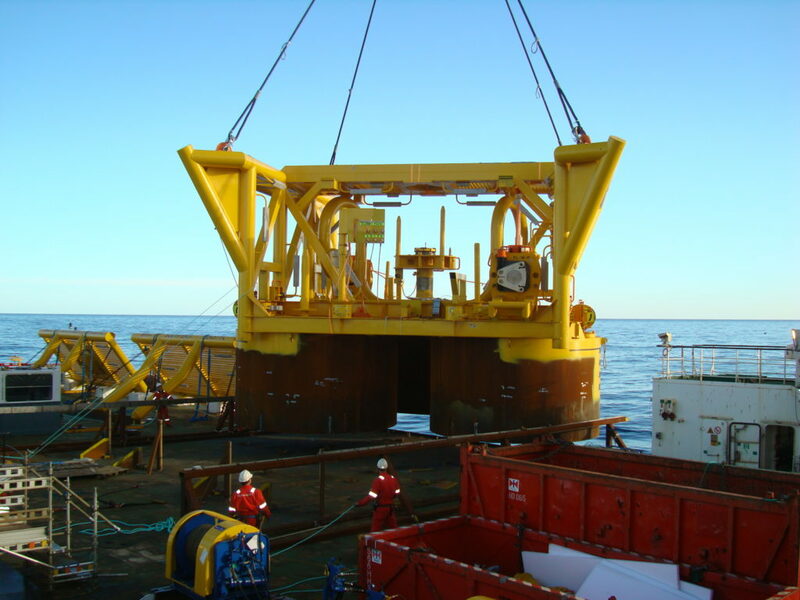 The riser has a flexible coupling to the base and is kept vertical by a buoyancy tank located about 75 metres beneath the sea. Two swivels installed on top of the tank allow a shuttle tanker to weathervane freely in relation to wind and current. The actual pick-up system for the hoses is supported by special buoys. Components are also installed in the seabed base for tension monitoring of the vertical riser and a radio link with the tanker to monitor its position and avoid hazards during loading. 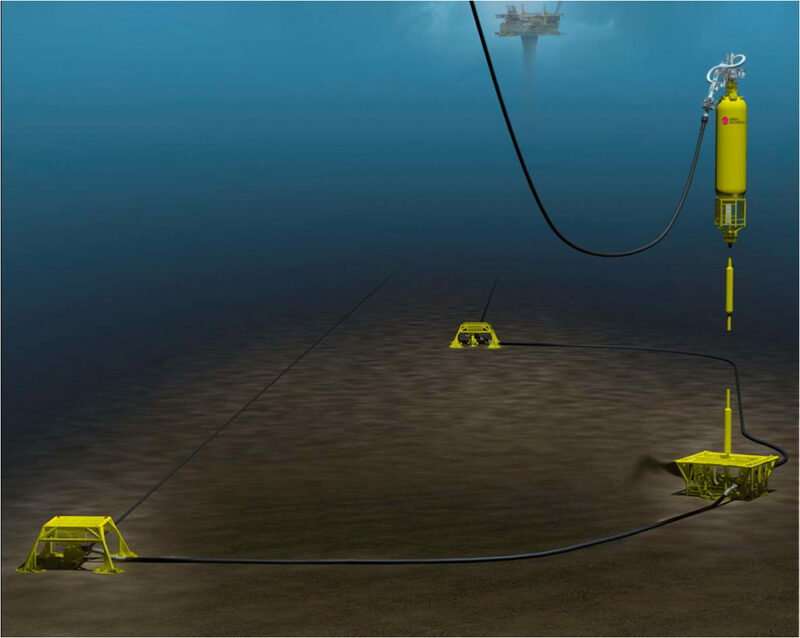 Although the first FSL components were placed on the field by Subsea 7 in 2009, the new system did not become operational until 2012. [REMOVE]Fotnote: FFU, no 1, 2013, ”Subsea 7 fornyer Draugen Oil Export system”. The many challenges faced in designing the new solution had delayed equipment deliveries. Plans and the installation method needed to be adjusted several times along the way. After the base and flexible flowlines from the platform were put in place, the 155-metre-long riser was towed to the field submerged between two tugs. The tube was supported en route by a combination of buoyancy tanks and chains. On arrival, it was “parked” on the seabed about 500 metres from the old FLP to await the buoyancy tank. It took almost three years to put all the pieces of the jigsaw in place. Problems with the buoyancy tank led to a two-year delay and almost 12 months was needed for final assembly. When the tank was loaded out from Kristiansund, it weighed about 210 tonnes. It was then towed horizontally to an inshore mooring site before being ballasted down to a vertical position. Following tank tow-out to the field and a complex but successful hook-up, the system was ready for use and the old FLP could be disconnected and prepared for removal. As mentioned above, the new FSL comprises two independent export flowlines. After an early cargo had been lifted, a valve on one of these became stuck in a virtually closed position. It could then no longer be used for loading. One reason why two flowlines were installed was to allow the system to be pigged – cleaned and inspected by pumping through a spherical device known as a pig. Unsuccessful attempts were made to open the valve in 2013, after the system had been operating for a year. However, a third attempt later the same year restored full capacity.